A while back, Laurie Boris gave us a very helpful and comprehensive overview of what you should consider when choosing and working with an editor. While I see no need to amend her concise guide, we here at IU did think it was time to take this a bit further. What can you do to make the overall experience of working with an editor better? What can you do to make sure you are getting your money’s worth — but not paying for things you don’t need — and creating a productive and enjoyable relationship with your editor? Here are a few things to consider. First off, why should you care if you have a relationship with your editor or not? You hire them, they do a job, and when it’s done, it’s done, right? Well, yes and no. Yes, you hire them. Yes, they do a job for you. But editing a book, in most cases, is not like unclogging a toilet. Editing, as writing, is a very subjective business, and while we all have guidelines that keep us from wandering off into the weeds, those lines sometimes can get blurry. I consider editing to be a partner task to writing. It’s not just about fixing the typos and catching mismatches of tense or plugging plot holes; it’s about sharing a vision and finding the best way to achieve that vision. When I respond to a query about editing, the first thing I do is ask the writer for the first 10 pages of their work. I go through it as I would any editing task, with a sharp and critical eye, but I also try to imagine where the writer is going with it, what the end purpose will be. With that in mind, I note any place that needs reworking in order to achieve that end, or any place that (I feel) does a particularly good job of leading the reader where I believe the writer wants them to go. Then I send this all back to the writer and let them decide if we are on the same page or not (pun intended). Sometimes we’re not, and we part company at that point. Sometimes we are, and we go from there. But my point is, I’m not just being hired to put in commas. I’m working to get the book to the highest level of the author’s vision that I can. Not my vision — the author’s. To do that, we have to be able to work together, and we have to be able to communicate clearly. An ill-fitting relationship won’t facilitate that. Now, before the real work begins, here are some ways you can make the process flow much easier and faster. Get your manuscript as clean as possible. Attend to the details. It might be easy and tempting to think, “Well, the editor will check for commas or catch missing quotes,” but is that really the best use of their time and your money? Some editors charge by page or by word count; others may charge by the hour. Do you really want to pay for someone to put in commas when you could do that? Sending out a rough draft of your manuscript when it still needs polishing is counter-productive. Do all those things we talk about here at IU to make sure your manuscript is the best it can be (read it aloud, send it to beta readers, etc.) before you send it to an editor. Likewise, don’t send your manuscript to an editor if you know you still have revisions to make. Again, this is a waste of time — yours and the editor’s. On occasion, I have been editing a book and get to a place where the author has a big red note saying, “More here,” or something to that effect. What that “more” is could have appreciable impact on everything that follows, yet if it’s not there for me to consider, how do I do my job effectively from that point on? Economically speaking, if I go ahead and edit what I believe the author is saying, but then find out due to revisions that my assumption was wrong, there’s a whole second round of edits that probably needs to be done, adding time and effort for me (the editor) and time and money for you (the writer). If you know there’s more work to be done before the book is complete, finish it first before you send it off. 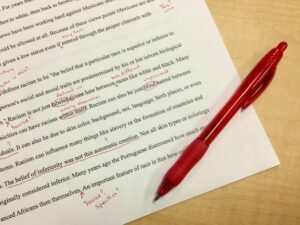 Finally, if you are making changes based on your editor’s comments or suggestions, make sure you’re correcting the latest version of the manuscript. I was once editing a pretty hefty novel for a woman, correcting spelling errors or obvious missing punctuation as I went. I would send the entire thing back to her for her consideration, yet when she returned it to me with some newly revised sections, I quickly noticed that all the spelling and punctuation errors were back again. She was fixing and resending her own version of the book, not the one I’d just gone through, so I was faced with those same copious errors that I’d already corrected once. You can imagine my frustration when I sent her a re-corrected copy, only to be given yet another revision of the old version with all the errors back in place yet again. Needless to say, this was neither a good use of my time nor her money. Just because I’m being paid doesn’t mean I’m happy doing duplicate work. Many writers are unsure about things like commas and quotes and conflict. The best way to learn about these? Read. Read books that are similar to yours, in the same genre, and note how the authors pace their sentences, how they use dialog to further the story, how they ratchet up the tension. One writer sent me a romance novel to edit, and when I queried her on some obvious problems like lack of emotion and lack of conflict, I asked if she’d read many romances. She confessed she’d not read a single one. The best teacher you can possibly have is another author in your genre who is doing it right. Read, read, and read some more. Then write. And when you send your work to an editor, make sure it’s your very best. Yes on all points, especially about sending the latest, cleanest version. I wait until after all my Beta reader revisions and still go through it several times after that. My editor loves me for it. Well, maybe that ought to be number two. It is absolutely crucial that you are “on the same page” re. the vision of the book – but also the style or voice. Thanks, Yvonne. I know you know the drill, and likely you and your editor have been partners for many years now. That’s the kind of partnership that works: easy, communicative and productive. Thanks for the backup, Frank. What you’ve added is absolutely true. I’ve worked with some authors for years, and we all work hard to produce the best story intrinsically possible for the characters. That’s what it’s all about! All of the above, with one caveat: the developmental editor. When I’m doing a full edit on a novel, especially when I’m coaching a new author, I want to see it when it’s about a third of the way through. I want to predict the problems before they become entrenched. I want to correct five or six egregious grammar or (especially) sentence structure errors before they become a hundred, and I have to edit them all out. I want to know where the author thinks the book is going, and either keep moving in that direction or correct the assumption. But other than that, what Melissa says is gospel. Especially the agreement between the two of you where the book is eventually going. This often derails misunderstandings, because you just ask, “Is this getting us where we agreed we are going?” If it isn’t, then that’s the problem that needs solving. Very true, Gordon; thanks for adding that. I wasn’t thinking about the early stages, but you’re right. If a writer is new at all this, it would be extremely helpful to have a good editing “coach” along the way. And, as you say, easier on you in the long run! There is much here to agree with. You are correct that the editor needs to see and understand the writer’s vision – their intent, I suppose. The story is the writer’s. Not the editor’s. I am frequently surprised – even horrified – when I hear stories from fellow Kiwi indie authors about their editors. They talk of editors overbearingly trying to take over the story. Of imposing grammatical ‘rules’. I wear two hats – book editor and an author of two novels. The editor me is the servant in the background. I hack a straight and clear path through choking verbal jungles. I clean up and smooth out. And I reassure and encourage. Sometimes it can be awkward. I was sacked because a writer – a retired naval officer doing a biography on a World War II New Zealand naval officer – wouldn’t agree that 10 pages of his A4 manuscript were plagiarism. He objected to my pointing that out and the red slash across the pages. I didn’t argue. It was his story. Oddly enough he did send me a copy of the published book. He had not included the plagiarised material. Paul, I love your image of trying to hack out a clear path through a jungle. So true. And you bring up a good point, that the story belongs to the author and not the editor, nor should we try to make it our own. I always tell my editing clients that they are the ultimate authority, and only they will know if my suggestions/corrections serve the story and move it in the direction they want. Like you, I’ve been fired for making unpopular suggestions, but if the author and I can’t agree, it’s best to part ways. I’ve also declined to take a job because the author would send me multiple-page emails arguing her case when I’ve suggested changes. It was ironic that she didn’t “get” that if she needed to explain a section to me to this degree, how was the reader ever going to know what she was talking about? The door swings both ways, and all we can do is our best to sort it out… or not. Now hand me that machete, would you? Next Next post: Which “Migration” Flash Fiction Story Gets Your Vote?